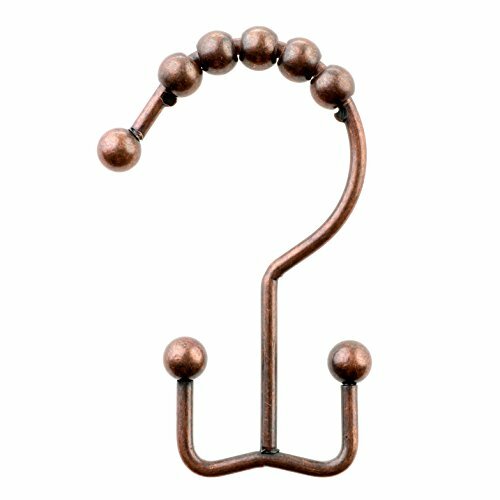 These oil-rubbed bronze shower curtain hooks fit standard 1" and 1.25" shower rods. Made of rust-resistant material for effortless gliding. Clean with a damp cloth. The package you will receive upon purchase will read Oil-Rubbed Bronze, but Antique Bronze is the most accurate description of this color. Convenient dual hooks hold curtain and liner separately and reduce liner/curtain drying time! Roller ball design makes opening and closing liner easy and smooth. Easy to install and use. Rust resistant finish. Fits all standard 1" and 1.25" diameter shower rods. If you have any questions about this product by SlipX Solutions, contact us by completing and submitting the form below. If you are looking for a specif part number, please include it with your message.